Post-Imperial Brecht challenges prevailing views of Brecht's theatre and politics. Most political theatre critics place Brecht between West and East in the Cold War, and a few have recently explored Brecht's impact as a Northern writer on the global South. 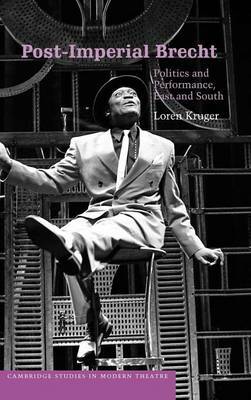 Loren Kruger is the first to argue that Brecht's impact as a political dramatist, director and theoretical writer makes full sense only when seen in a post-imperial framework that links the East/West axis between US capitalism and Soviet communism with the North/South axis of postcolonial resistance to imperialism. This framework highlights Brecht's arguments with theorists like Benjamin, Bloch, and Lukacs. It also shows surprising connections between socialist East Germany, where Brecht's 1950s projects impressed the emerging Heiner Muller, and apartheid-era South Africa, where his work appeared on the apartheid as well as anti-apartheid stage.